Front and centre on the app store is Blogo, Blogo is the easiest and fastest way to write, publish and manage multiple blogs. We;ve taken a look at other Mac apps to help with running your own WordPress based blog. Metropolis and PixelPumper were two such examples but sadly a lack of updates rendered them all but useless, especially when Mavericks came along. 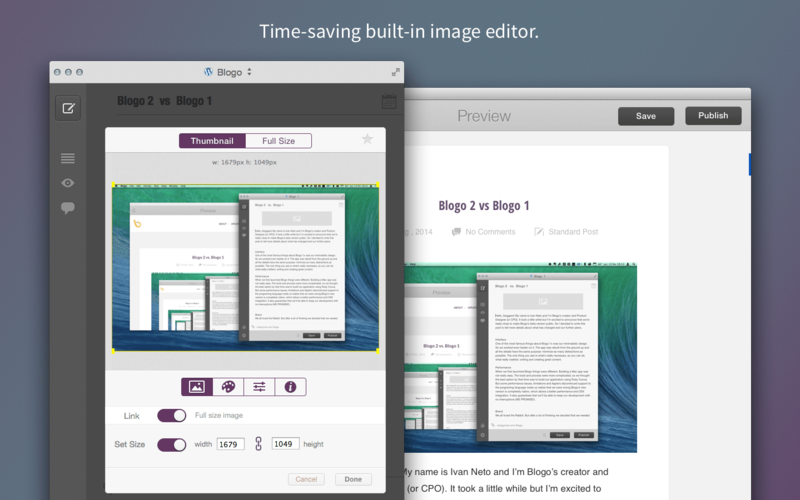 Blogo looks like another fine contender for Mac Apps to help manage and work with your WordPress Blog, Right now it’s only limited to a wordpress blog but according to the support page Tumblr and Blogger support is going to come soon. Of course there’s live previews, working offline capabilites which are all part the course of what any WordPress App for the Mac should have but Blogo comes with a built in image editor, full cpu core support and other goodies to get you excited about.